Many people suffer neck pain and stiffness every day and most never get the care that they need. Chiropractors are highly trained professionals able to offer natural neck pain stiffness treatment. The first step in successful long-term pain treatment is the chiropractor finds the cause of the pain through x-rays if required or digital posture analysis. Because it is not possible to treat neck pain unless the location of the problem is known, chiropractors are specifically trained in using diagnostic tools to help pinpoint the source of the pain, making chiropractors very successful for treatment of the pain and stiffness. Next to the brain, the spine is likely the most complex part of the human body. Nearly every nerve in the body runs through it. If the spine is misaligned, muscles will tighten and even spasm in that area. This is likely a defense mechanism to protect the misaligned spine along with the spinal cord. One of the most common causes of misalignment is poor posture or repetitive motions using poor posture. With a large portion of today’s workforce hunched at their desk, working on a computer for eight hours a day, not having good posture, will likely continue to be a major cause of neck pain and stiffness for years to come. Leaning the head forward for long periods of time pulls the shoulders forward. This pulling of the shoulders forward causes the back to round putting strain on the vertebrae. Whiplash is another leading cause of neck pain, upper shoulder pain and stiffness. Many people think whiplash comes only from car accidents; but it can be caused by many activities, including sports and amusement park rides. Basically, whiplash injuries occur when a rear impact causes the cervical spine to be knocked out of alignment, with the upper part being hyper-extended and the lower part being hyper-flexed. This causes strain on the spine as well as the soft tissues that hold the spine together. In addition to neck pain, most whiplash victims experience headaches and even migraines. 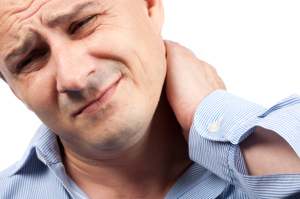 Neck and back pain can severely diminish a person’s quality of life. Normal, everyday activities can become tedious and even unsafe. Whether poor posture or whiplash is causing the problem, there is no reason for you to continue living with the pain. And, medication does nothing but mask the pain. For long-term treatment of neck pain and stiffness, you must address the underlying issue. Too many people ignore their neck or spinal pain in the hopes that it will eventually just go away. Many times the pain does eventually go away; but, the initial cause of the pain, the misalignment of the spine, remains. And, over time, it is likely that the pain will return as the same area becomes aggravated again. It is typical to believe that because so many people live with neck pain, that it must be normal. This is the kind of thinking that causes many people with neck and spine problems to get into situations where the problem have gone on so long that it can no longer be corrected. Do not become one of these people. Let us help you correct the problem before it gets to that point. A chiropractor can help get rid of the pain using drug-free, non-surgical methods. Don’t delay and call your chiropractor today. Visit our chiropractic offices in Toronto near St. Clair St. W and Bathurst St. by calling (416) 479 8311.